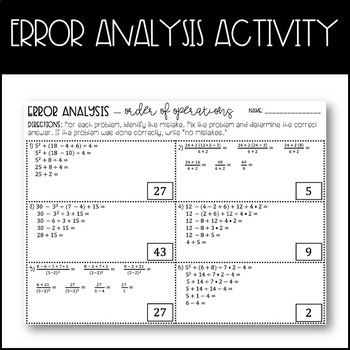 This download includes two activities involving order of operations. The problems vary in complexity, but do NOT include negative integers. 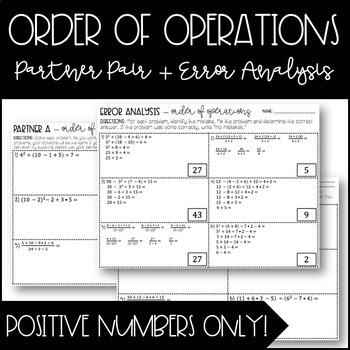 **This activity is a great way to determine student understanding of the order of operation rules. Computing a problem is one thing, but trying to find an error is a completely different story. Students will pair up to complete six problems over order of operations. One student will act as partner A and the other will be partner B. The problems for each partner will be different, but the solutions will be the same. If they get the same solution, they are correct! If they get different answers, one (or both) partners have made a mistake. The partners will need to re-work their problems to determine where the mistake was made. If they can’t find a mistake, have the partners switch papers and try again! **Although this activity is completed with a partner, students must show an independent understanding of a topic in order to complete their individual problems. There is an answer key provided for both activities!